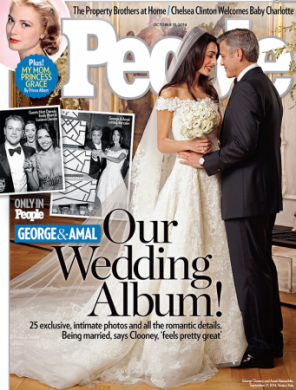 After George Clooney and Amal Alamuddin exchanged traditional vows, platinum bands and, yes, a lengthy kiss at their 30-minute wedding ceremonyon Sept. 27 in Venice, Italy, the newlyweds turned to their family and friends. And the place went wild. Cheers and applause filled the gilded hall at Italy's historic Aman Canal Grande Venice as around 100 guests, many with tears in their eyes, celebrated the much-anticipated union of the Oscar winner and his barrister bride. "It is a privilege and a pleasure for me to dress him for this occasion, in which he stars in the most important role: that of the groom," Armani tells PEOPLE. "[Giorgio is] the class act of all class acts," the actor says. "He's been a good friend for many years and the night wouldn't be complete without him." "He's such an elegant designer and such an elegant man," Alamuddin, 36, tells PEOPLE. With three days of parties followed by a civil ceremony, the festivities took center stage in Venice, which the actor calls "the most romantic city in the world" and a natural choice for their wedding locale. "We met in Italy," says Clooney, who has long owned an estate on Lake Como. "We have a home there. We knew that was where we wanted to get married." While the guest list included famous pals like Matt Damon and Bono, the couple kept the celebration intimate and sentimental. They tapped Nora Sagal, the daughter of friends, to sing the Irving Berlin standard "Always" at the ceremony – which happened to be the song Clooney's parents, Nick and Nina, danced to at their wedding – and Cole Porter's "Why Shouldn't I?" for their first dance at the reception.